On the eve of the Queen of England’s Diamond Jubilee Prince Harry makes a short, but significant stop in Belize, the jewel of the Caribbean. This visit has tremendous potential for the Belize tourism industry and the hotel and resort operators in the main tourism sites. Sandy Point Resorts on Ambergris Caye is but one operator excited about the visit. We are more than the Caribbean and Central America. Our diversity is our strength and the large variety of experiences that can be enjoyed on a Belize vacation cannot be matched in any of the other destinations in the region. "The opportunity to host such a high profile visitor to Belize provides validation of the Belizean tourism product in so many ways; in the first instance it signals that Belize is a safe destination for travelers and has a stable environment where visitors of all kinds and social stations can be comfortable enjoying themselves, and the many Belizean attractions, without fear of crime and being hassled." From this it follows that Belize has attained a level of sophistication and luxury in the hospitality product that can cater to the very highest echelon of international travelers. At the the fabulous Coco Beach Resort, Belizean Shores and vacation villas of Belizean Cove Estates, for instance; heads of state, captains of industry and finance from around the region and even television stars has been hosted, all part of the growth in Belizean recognition worldwide. The recent hosting of the ABC TV’s hit The Bachelor is another example of Belize luxury on display. On a deeper level though, it is the Cayes of Belize that have captured much of the attention because they offer a place where guests can walk a sandy beach to great restaurants, take a kayak out for a snorkel or just relax on the beach or at the bar with a drink and know that they are safe and can be themselves. As in other locations around the world the impact of publicized visits by celeberties has the result of stimulating deamnd by others who wish to share the same, or similar experiences. The Queen visited Belize some thirty or more years ago when Belize was a very different place. Now the added marketing and and growth in the tourism sector has reached the point where people are starting to realize just how unique a vacation product Belize has to offer. Belize is more than the Caribbean and Central America. the diversity of resorts and people allow the country to provide a variety of experiences that cannot be matched in any of the other destinations in the region. Uniquely Belizean has become the catchphrase any time someone tries to explain how different the feel of Belize is to the visitor. Belize has recently become known as a destination with a lot to offer, beyond the traditional backpacking through the jungle; although that is still a great experience, the country now has superb restaurants, luxurious beach front resorts and a laid back lifestyle that brings everything down to the human level, allowing the visitor to truly relax and indulge. Sitting here around the beautiful pool, just steps from the beach, anyone would have to admit that this is a truly magnificent location and everyone can certainly feel pretty royal just being here. .
To have a look at the Sandy Point Resorts you can go to either the property sites: http://www.cocobeachbelize.com. 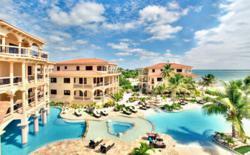 http://www.belizeanshores.com, http://www.belizeancove.com. or the Sandy Point Resorts site at:http://www.sandypointresorts.com.